Keiner da - Canada podcast! 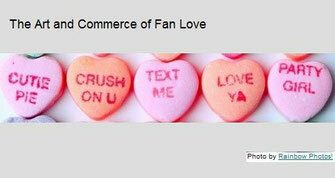 CBC Radio did a podcast about "The Art and Commerce of Fan Love" mentioning the Jemma movement. Listen to a wonderful and hilarious Jemma fan talk about her experience with Jemma while she recounts the events that took place over the last month. Also there is an interesting bit about how the broadcasters react and what possibilities there could be. So Emma alluded to it in an episode before - Keiner da - aka Canada is Jemmaaddicted, too. But wait, it's quite the opposite of 'Keiner da' - (No one there) - we're all here boosting the train of fanlove to break through the laws of the usual constrictions put upon us by space, time and most importantly the broadcasts. "The Art and Commerce of Fan Love"
"What happens when you bring together the internet, a niche international fan base, and an obscure German soap opera? Quite possibly, the future of television. Hand aufs Herz fan Clare Lawlor and digital strategist Xiaochang Li tell us all about the world of fan subbers – people who painstakingly do their own translations and subtitles on programs they love, and then put them up on the Web on places like YouTube. It sounds harmless and probably good for publicity, right? Well, the broadcasters aren’t always so keen. Copyright, dontcha know. But could it make good business sense to allow your fans to do it? (Runs 16:14)"
Thank you Clare and CBC for bringing us this really cool podcast which gives a lot of inside in the ongoings of the gap between fans and broadcasts. Well, since my first langage is French, I will write this in French and I hope you don't mind. It's Jemma International, after all :-) D'abord merci pour ce podcast avec Clare que j'aime beaucoup. Ce phénomène que nous vivons présentement est effectivement très spécial. Mais si le lien entre commerce et fanlove est intéressant, je trouve qu'on devrait davantage se préoccuper du lien entre l'art et le "Fanlove". Je suis une grande fan de Jemma, mais je me demande parfois si on ne mets pas trop de pression sur les writers et sur Lucy et Kasia. Les artistes ont besoin d'espace pour créer. Bien sûr, ils ont besoin de l'amour du public mais en même temps, cela peut devenir lourd. Enfin, je crois que notre plus grande responsabilité en tant que fan n'est pas pour le broadcaster mais pour ces artistes à qui nous devons beaucoup. Voilà, c'est ce que je voulais dire. Merci et à bientôt. I love the title of the Podcast! Our Canadian friends were having lots of fun with that on one of the forums :) I also appreciate the post from Marie-Helene. In all the hype it can sometimes be forgotten the pressure on the actors and writers. I am sure it is a double edged sword of feeling great about their success and the love of fans but then there is the pressure that goes along with that. I also have to say that being from Arkansas and hearing that on the podcast was pretty funny because I had communicated with her and wondered what's the chance that I am sitting in Arkansas USA on some forum from who knows where reading about a German Soap Opera and someone suggests a Canadian podcast and I hear her mention Arkansas! The possibility of that makes me just go wow how great is it with all these people from all over getting together in harmony to chat and talk about two fictional lesbian high school students! Just crazy actually LOL! Thanks again for ALL you guys do here!